Jail records obtained by KGW show Jeremy Christian faced discipline for several fights, making threats and using of a racial slur toward a deputy. 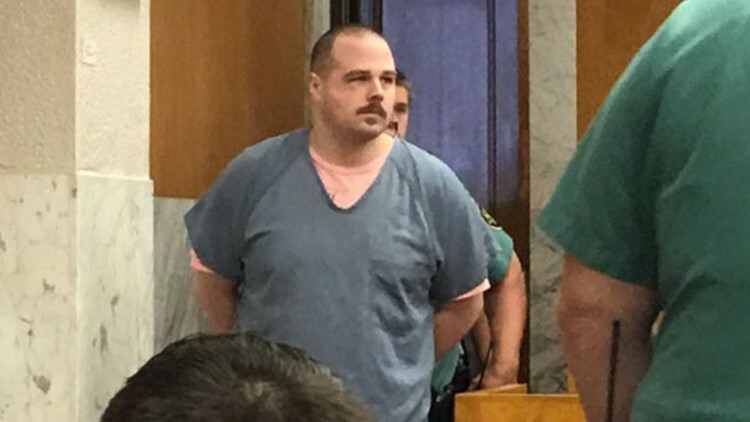 PORTLAND, Ore. — The man charged with fatally stabbing two people on a Portland MAX train is causing problems behind bars. Since his arrest in May 2017, Jeremy Christian has faced discipline for five separate incidents in jail including fights, threats and use of a racial slur toward a deputy. Christian has been placed in lockdown as punishment after each incident, limiting his movement within the jail. One incident resulted in a misdemeanor assault charge. Christian is being held at the Multnomah County detention center in downtown Portland. He’s scheduled for trial in June on aggravated murder charges for the MAX attack. “Believe me, nobody wants the trial to come quicker than the staff at the county jail,” said former Multnomah County Sheriff Bernie Giusto. KGW obtained misconduct reports for Jeremy Christian, along with his jail visitor logs, through a public records request. Christian faces multiple charges from the attack on a MAX train in Northeast Portland in May 2017. Prosecutors accuse him of yelling racial and religious slurs at passengers on the train. When three people tried to intervene, prosecutors say Christian stabbed them; two of them died from their injuries. On May 30, 2017, just four days after his arrest for the fatal MAX stabbing, Christian got into trouble for yelling and pounding on the cell of another inmate. He told the female inmate he was going to tear the cell door from the hinges and rip her head off, then threatened a deputy. “He told me, ‘I slash throats for a living,'” deputy Gretchen Rosa wrote in an incident report. One day later, Christian was in trouble again for being disruptive and failing to follow orders after refusing to remove a jumpsuit covering his cell window. Then, on June 1, 2017, Christian was written up for being disrespectful to a deputy after using a racial slur. “Christian immediately asked if we were going to belly chain him when he came out on a walk, and said, ‘You and that (N-word) sergeant can go (F-word) yourselves,'” deputy Ryan Cook wrote in an incident report. Christian was also involved in two fights behind bars, according to the jail reports. On April 2, Christian scuffled with an inmate during a walk inside the jail. The other inmate was taken to the hospital to get stitches for a cut on his nose. Christian was not seriously injured. Christian was ordered on lockdown for 35 days as punishment for the fight. On July 29, deputies say Christian assaulted another inmate, Aundre Mills, in his cell. Christian was charged with assault in the fourth degree, a misdemeanor. He has pleaded not guilty. Visitor logs show nearly a dozen people have come to visit Christian behind bars. His most common visitor is his mother, Mary Christine Christian, who sees him almost weekly. Several friends and family have also visited the jail. Additionally, defense attorneys, a private investigator and a defense psychologist have met with Christian, according to visitor logs. The jail records show Christian has a history of causing problems behind bars that date back well before his arrest in the MAX attack. In June 2002, while awaiting trial on robbery and kidnapping charges, Christian was found with contraband that could be used as a weapon in his jail cell. Christian had stuffed a large dictionary in a pillow case, according to deputies. One month later, jail officials classified Christian as “an escape risk” after finding a 20-foot-long rope made from towels in his cell. In September 2002, Christian was indicted for unlawful use of a weapon and supplying contraband. Deputies found a device called a “blackjack” or a “sap” hidden under a blanket in Christian’s cell. It featured a ball of compacted wall paint stuffed in a sock. The ball was extremely hard, like a billiard ball, deputies wrote. The reports detail 14 cases of jail misconduct from May 2002 to April 2018. The incidents show a pattern of violent, disruptive behavior. Christian often fails to follow orders from jail staff, resulting in 10-35 days of lockdown after each incident. The jail reports suggest several deputies are required to respond when Christian causes a disruption. In several incidents, reports indicate Christian yelled at jail staff, using vulgarity and threats of violence. Despite the incidents, a Multnomah County Sheriff’s Office spokesman said the jail is equipped to deal with Christian. “He doesn’t present any challenges we haven’t encountered before or that we can’t handle,” said Sgt. Brandon White. KGW reached out to several attorneys who represent Christian but have not yet heard back. Christian is currently being held in an “administrative segregation unit” at the jail. That unit is reserved to separate inmates who routinely have conflicts with staff or other inmates. “Left to his own devices, he would kill somebody in the jail. He’ll kill somebody in the jail if he a chance to,” said former sheriff Giusto.